In today’s tutorial I will show you how to how to use RadioButton group in Android. Lets go directly to the code. Let’s see the layout for the RadioGroup first. 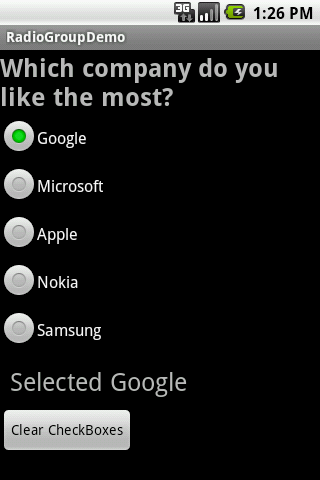 android:text="Which company do you like the most?" This will create a layout file with a radioGroup with 5 radioButtons and a button to clear all checkboxes and a TextView to show the selected value. Now let’s look at the java code. The onCheckedChanged function is called whenever you check a radioButton or uncheck it. Then inside this function we compare the id of the clicked one to match with ours in the xml file to do a specific task.